Meme is a middle-aged man who lives in an abandoned building. Being an expert in apparitions field, he solves Koyomi and others' problems. Although he sometimes expects compensation, he does not require it always and seems to help those in need from good nature. Due to his vast knowledge of supernatural studies and general oddities, he serves as Araragi's informant during his stay in the city. Oshino is a graduate of Shinto studies in college, although he never pursued the career of being a Shinto priest. Despite that, he is perfectly capable to accomplish spiritual works of a Shinto priest, such as exorcising entities and solving paranormal mysteries. 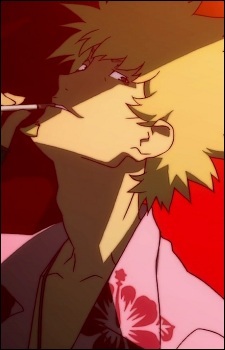 He occasionally wears a Priest's outfit, as seen with the session with Senjougahara and the heavy crab. Meme's other notable accessories include an earring on his right ear and a necklace, both consisting of an inverted cross.